-- Patricia Hall, Minden, LA. Southern food historians say tea cakes evolved from an English recipe brought to America by British settlers in the 18th century. They were known as �little cakes� and were served with afternoon tea, but are called tea biscuits in Britain today. The basic recipe was passed by word-of-mouth for generations. Unlike the English, Southerners made the cakes for snacks or special occasions, especially at Christmas, Valentine�s Day and Easter. Each cook added special ingredients, such as molasses or grated lemon rinds and spices. And Help Us Preserve The Memories Forever! Remember back to your childhood, when you went over to your grandmother or aunt�s house and she served warm, delicious tea cakes? It was like a lovely, warm bite of hope, optimism, and the promise of a better tomorrow�all in one cute little tea cake. Lovely aromas of vanilla and nutmeg wafted through the house, giving it a cozy feeling. Maybe you have fond memories of your mother or grandmother creaming butter and sugar together in a big bowl in preparation for making tea cakes while you sat in the kitchen. Tea cakes have been called �the national cookie of African-Americans.� Unfortunately, these little bites of pure heaven are disappearing fast. Why? Because of the onslaught of fast food and convenience foods. Many young people are far more familiar with a super-sized Happy Meal than a tea cake, and that�s a shame. Soul food, in all its wonderful glory, is slipping out of view. Tea cakes are soul food, and as we all know, soul food is rich and wonderful tasting. But What If You Could Help Keep The Tea Cake Legacy Alive? �What if you had a chance to keep golden memories of the good old days alive? �What if you had the opportunity to try out some great recipes? 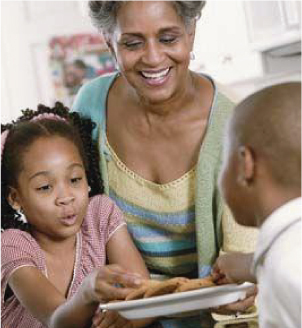 �What if you could pass down those recipes to your children and their children? A short story about a day when you were upset and sad�until a nice, warm tea cake made you smile. An article about the place of tea cakes in African-American society. A funny thing your grandmother said about a certain tea cake recipe. A recipe for lemon-poppyseed tea cakes, cinnamon tea cakes, or maple tea cakes. If you have memories of tea cakes, we�d like to hear from you. What do you get out of it? We will credit all accepted submissions, so your name will appear in print. If you�ve got tea cake memories and you�ve always wanted to be a writer, this is your chance! We will also add you to our email list and notify you the instant the book is published so you�ll be able to get a first-edition copy. When we receive sufficient submissions, this book will go to press and then we will have to close our call for submissions. So if you wish to take advantage of this unique opportunity to preserve a soulful slice of our history, you need to act now. We thank you for your interest in preserving a valuable and delicious part of our heritage. P.S. Please don�t delay. We only have so many pages to fill, and when we fill them we will go to press. © Copyright 2015 The Tea Cake Company. All Rights Reserved.